Last week we saw Digg releasing an iPhone app and in a quick succession they have now announced an app for Android devices.With these mobile apps releases they are now gripping their presence in this mobile era. Digg for android is having similar features which we saw in their iPhone app.You can browse,digg stories and add comments.The app also supports landscape mode, making it more easier to read and browse.But did they forget about the existence of social networking websites? Well, as of now there is no way to save interesting articles for a later read , share to Facebook or Twitter.The links cannot be opened in your native mobile browser too.These are some major features they need to add soon.Hope they are working on it and will push an update soon. 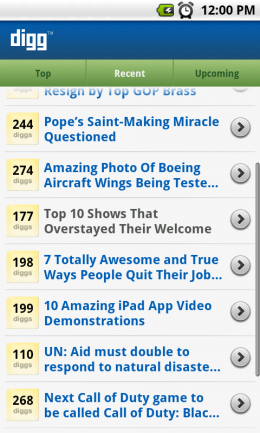 Download Digg for android by searching “Digg” in the Android Market.